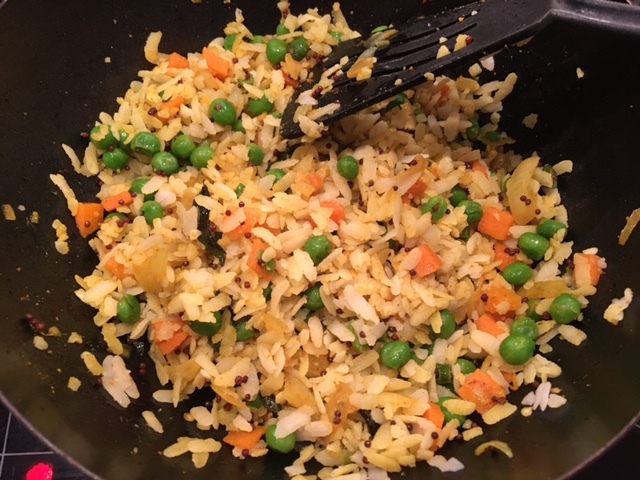 Traditionally, a Central Indian dish, Poha is extremely popular in the states of Maharashtra, Madhya Pradesh. Gujarat, Maharashtra, Madhya Pradesh, Rajasthan and Delhi. Poha as a dish is continuously evolving and becoming more flavourful. The dish looks equally inviting in its many avatars. Its popularly eaten for breakfast or as an evening snack. Wash the beaten rice thoroughly in a strainer and keep aside. Add mustard seeds, followed by the green chillies and curry leaves. Sauté for 30 seconds. Now add the chopped onions and sauté for 3 minutes. Put ½ a tsp of salt at this stage and keep stirring till slightly golden brown. Then add the chopped carrots and continue to cook for 3 minutes. Add the boiled peas and continue to cook for another 3 minutes. Add the turmeric powder and stir. Now put in the washed rice flakes and a teaspoon of salt. Stir well to mix everything. Sprinkle some water in, not more than 2-3 teaspoons and cover the pan for 2 minutes on low heat. Open the lid and squeeze the juice of a lemon into the dish and add the roasted peanuts. There are various types of flattened/beaten rice flakes available in the market (thin, medium, thick). I use the medium one. If you buy the thin one, the rice flakes will end up sticking to each other. A lot of people serve this dish with accompaniments like chopped onions and Indian sev or bhujia (casse-croute indiens). Haldirams is a popular brand of Indian snacks that is available worldwide. One can sprinkle aloo bhujia on the poha for a crispy tangy flavour. If you don't have an Indian store close to you, you can buy flattened rice on Amazon UK.